Given that New Year’s is coming up, it’s only appropriate to talk about how you acquire shiny new stuff in Starfarer. Oh, wait… Christmas is the “presents” holiday, New Year’s is the “get drunk” one. Never mind! But just the same, that’s what I want to talk about. Shinies, not getting drunk. … now that my feeble attempts at humor are over and done with, let’s continue. Battles are a key way to progress through the game. They’re not the only way – you’ll be able to build up an economic power base, for example – but that’s not what this post is about. Battles offer an opportunity to get stuff for free, even if you don’t fancy yourself a pirate, but something slightly more honorable-sounding. The flip side is you can easily lose some hard-earned assets, too – ships, crews, even cargo if the outcome is bad enough. What I’d like to do is outline the mechanics as they stand, talk a bit about the motivations for doing it this way, and sprinkle in a couple of screenshots. For the sake of this discussion, let’s assume the player won the battle. If they lost, things happen slightly differently, but it’s more or less a mirror image. If you’ve played the combat portion of the game, you already know that instead of simply blowing up when hull integrity reaches 0, ships become floating, disabled hulks. There’s a small chance for each of these to be repaired after battle (most likely, player skills will allow you to raise that chance). The options for enemy ships are slightly different. Retreating ships have a chance to be captured after battle, and the player has a choice between boarding and scrapping these. Disabled ships that can potentially be repaired can also be boarded or scrapped, while ones beyond repair are scrapped automatically. Also, if a ship takes hull (not armor) damage, then there’s a good chance that some crew will be killed, in rough proportion to how much damage the ship actually took. It’s possible to win a battle and end up losing enough crew that you can’t meet the skeleton crew requirements to deploy most of your ships – so it’s a good idea to carry enough extra crew for these kinds of emergencies. Outside of combat, it’s assumed that automated systems let you get by well enough to navigate the ships, so even extensive crew losses won’t stop you from being able to move around the Sector. Boarding captured ships is relatively safe – the commanders of these have surrendered, and the crews aren’t putting up any resistance. Therefore, the risks to your marines are minimal, and the ships can even be captured by your crew. On the other hand, personnel boarding disabled ships face many dangers, from malfunctioning systems to pockets of resistance by surviving enemy crew. Only marines can even attempt this kind of boarding action, and will often take losses. 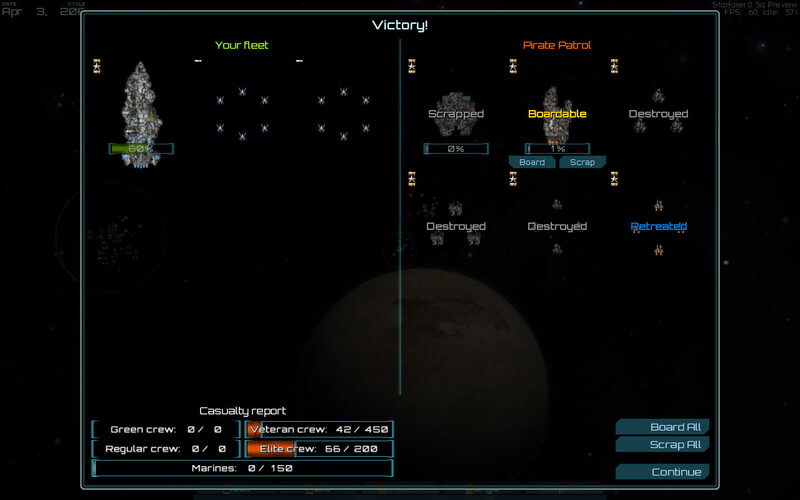 To recap, the player gets to make a “board or scrap” choice for either captured or repairable enemy ships during this initial post-combat phase. The second phase is all about transferring any recovered cargo to your fleet’s holds. The amount of stuff you get depends on the outcome of the initial phase. Boarding ships produces more loot than scrapping them, and of course any ships that managed to retreat get away with their cargo intact. The top half shows your current cargo, crew, fuel, and whatever else falls under the loose definition of “cargo”. The bottom half shows what’s been salvaged after the battle. In particular, the weapons come both from the cargo of the enemy fleet and from what was actually mounted on the enemy ships. I had two main goals when approaching the design of both these mechanics and the corresponding UI: 1) make it hassle-free and 2) offer the player some choices. These two are at odds with one another (figures, doesn’t it? ), so as usual the process became one of looking for a sweet spot between the two extremes of “no choice” and “way too much of it”. A simplifying assumption I made is that the player shouldn’t be asked to say whether they want to try to repair a ship or not – it’s just attempted automatically. The key point is that there’s no cost to making the “repair or scrap” choice, so there’s no need to bother the player with it. If the “repair” choice had a cost (say, some supplies to attempt it), then it would need player confirmation. The “board or scrap” choice doesn’t come up all the time, but it does have a cost – the player is likely to lose marines every time they do it, so it has to be an explicit call on their part. How often the after-combat screen comes up is actually an important question, and one I don’t have a good answer to at the moment (and it depends on playstyle, to boot). If it’s not too often, then it’s ok to have more choices – and have it be a little more work. If it’s more frequent, then it needs to be as streamlined as possible. I’m going with the streamlined approach for now, but will be keeping an eye on how it plays out – and whether it provides enough flexibility. This entry was posted on Saturday, December 31st, 2011 at 6:13 pm	and is filed under Development. You can follow any responses to this entry through the RSS 2.0 feed. Both comments and pings are currently closed. Drunk on all those good informations to start the year. What sort of costs are involved in repairing disabled ships? You imply in the second dot point that disabled ships that get repaired are done so only to the point that they can fly again, and that full repairs would then need to be carried out elsewhere. Would this be the case? If so, AWESOME, and would you need to carry certain things in your fleets to be able to effect such makeshift repairs? In the second screenshot, how does the Cargo bar (455/500) relate to the stuff on the rest of the screen? Loving it Alex. Loving it. I can has 0.5a naow..? Yeah, further repairs will take place after combat, using up “Supplies” and requiring more crew to perform faster. The cargo bar… let me take a step back. There are 3 “capacities” your fleet has – cargo, personnel, and fuel. Items/crew/fuel/etc that use up any of these all share the same grid. The cargo bar indicates how much cargo capacity is used at the moment (so, for example, picking up a stack of fuel wouldn’t change it, but picking up a stack of supplies *would*). Marines and crew both use up personnel capacity. This sounds really great to me. I’m really excited about the next release. I enlarged the loot table and looked at it for a while soaking it all in. Afterwards I ended up forgetting what I was looking at and clicked “Take All”. Seemed natural! Wow! That looks awesome Alex. So in the situation that you are presenting, it looks like the captain will not be able to take most of the supplies that he captured because he only has 45 spots of cargo room remaining right? In his situation having a freighter or two that he didn’t include in the battle, but still had in his fleet, would have enabled him to actually take all 253 of those supplies along with the weapons? Pretty sweet. Hmm, then again I see that there is also a supply counter on the right side, which is at 250/500, so does that mean that you could theoretically acquire 250 more supplies, but couldn’t because of the lack of room in the cargo hold? So my current thinking is that the Cargo bar is the overall limitor on what you can carry, and the three other bars limit each type of resource individually within that overall Cargo bar limitation. Hmm. I can’t wait to be able to experiment with the game itself to get a better grasp on it at some point soon. heh heh Great stuff to think about. @Zarcon: Right, having a freighter or two would let the captain scoop everything up. The supply counter on the right, you got it – it just means you could potentially carry 500 supplies, assuming you had nothing else. But crew, marines, and fuel do NOT fall under the overall cargo capacity at all. Crew and marines share “personnel capacity” (that’s why marines show 150/150 – there’s 150 berths left after you count all the crew), while fuel is completely separate. Hmm… by that logic, maybe Supplies should show 250/295 instead of 250/500 – showing how much free space you have to take on additional supplies, rather than the total space. Yeah, I think I’ll change it to be that. When you pick stuff up with the mouse etc, all the relevant bars move around, so it should be easy to see what’s affecting what. I’m quite a fan of after battle reports and sorting through statistics and wouldn’t mind being given these kinds of choices, in fact it’s very exciting with the possibilities of boarding actions present. Just as long as it’s easy to sell less useful items and such. Will ammunition types be highlighted based upon which ones your ships use? Overall I’m really excited for the next update. Will definitely be buying this game once the next release is out. When will that be again Alex ? I like the design, keep it up! What are supplies used for? Is it repair parts just for repairs, or do they contain crew supplies to keep your people alive (food, water, air etc..)? Might be a bit overkill feature, but it could have some interesting gameplay resulting from it. Like a ship having to abort chasing pirates because they ran out of food in the middle of everything. @Scroll: There are no ammunition types, all that falls under “Supplies” (that stuff in boxes that you see in the second screenshot). What’s in the boxes? Whatever your fleet happens to need, of course! The magic of advance planning, done for you by your logistics officer. @Dimitar: Shooting for a preview release this month (yikes), and a full-on release not too long after that. @Reactorcore: Supplies are the catch-all for “whatever your fleet/crew needs to keep going”, and some other stuff too. So the situation you descibe should be quite possible. This looks great Alex things are shaping up nicely, I too am looking forward to the next release, looting after a battle is half the fun I feel in any game. And Happy New Year to all!! Yup, great! I love looting things. Gonna ramble about loot. The other only-marginally-fun thing is resources similar to minerals and goons in SPAZ – they don’t feel much like ‘loot’ and more like a health-bar of sorts you have to bother to keep topped up. That’s why I’m happy that the crew come in various experience levels rather than ‘generic faceless,’ which makes looting them more fun and justifies having a separate ‘crew capacity.’ Fuel and ‘supplies’ fall into this ‘health bar’ category, and I’m glad ammo-types and food and whatnot are coalesced into a generic ‘supply’ bar because one can have too many health bars, heh. Especially if those bars are unlikely to be difficult to replenish and all recharge at the same time. I suppose the need to bother with supply, fuel, and crew levels implies a sort of ‘expedition-into-deep-space’ feel where friendly star-bases where one can freely (or cheaply) resupply are few and far-between? Relatively? Yeah, right on about the “expedition-into-deep-space” feel – that’s one of the main reasons to have fuel/supplies. Also opens up some possibilities like establishing a forward supply base to enable you to explore/travel farther afield, and all that. Ah, but will you have to keep that forward supply base supplied via automated supply ships that you (or an AI underling) set up, or will it magically produce supplies? That I guess brings up questions about economics and crafting and supply lines, but that’s a different topic. Yeah, that’s a larger topic I don’t feel comfortable tackling in detail just yet. That being said, I think the options would be 1) set up extraction and refinement/manufacturing facilities at the outpost, 2) resupply it yourself, or possibly 3) let independent AI traders do it through some kind of supply/demand mechanics. Again, still too early to say something definitive. I wouldn’t want supplies to appear out of thin air, though. Well I’d hate to be my logistics officer but that does make things a lot cleaner. This looks and sounds so incredible. I’m so happy someone is building the game I’ve wanted forever, and I’m absolutely ecstatic that it’s being built with obvious love. Oh, and I’d hate to be my logistics officer, too. Looks interesting. Looking forward to the campaign, it is at that point that I will be interested in buying into the alpha of the project. Is the whole game going to revolve around one fleet with a mobile station ala Starscape or a more traditional multiple fleets, take command of 1 vessel setup? @Cryters: Your fleet is generally not going to be able to construct ships – that’s a job for planetary and orbital facilities. 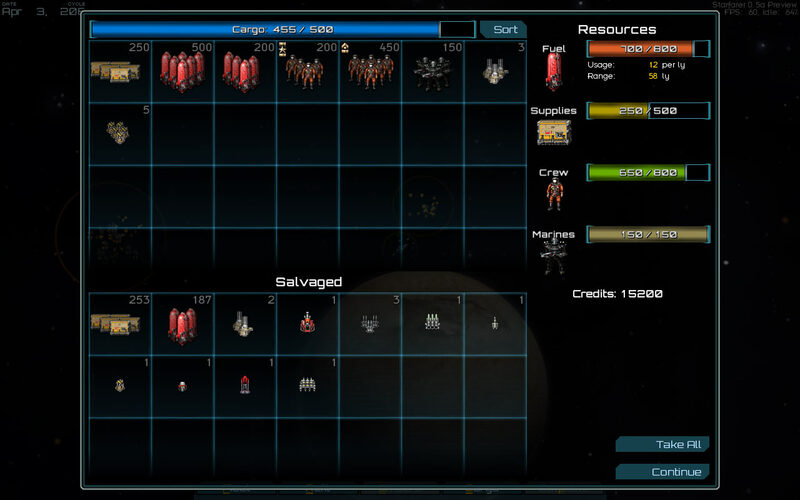 That said, you’ll only be in direct control of a single fleet – but you’ll be able to construct multiple outposts. Other fleets that you own but don’t directly control are a possibility down the line as well, just have to see how things play out first. Just saw this over on TotalHalibut’s YouTube and ive got to say. I wish i knew about this game 2 days ago so i could have gotten it for my birthday! haha. Can’t wait to see what the whole game will be like! I know one thing i will be getting it soon. Do you use fuel in battle and will there be any strategy involved in boarding other than larger force wins with partly random losses? Sounds just great, enjoying the game so far, and what you discribed as the full game has me very very excited. After playing the missions a few times will there be a way to resupply ammunition during a battle? Sort of like how fighters do it but with the larger ships, perhaps to a freighter full of goodies? Ugh, sometimes I wish that you’d never blog anything at all, I’m going to be antsy the entire time until I get my grubby, grubby hands on 0.5a! Well, gonna go play the same 5 or so missions again now.